Word is Coach Mark Richt and others are going to push hard for the Georgia/Florida game to go home and home and not be renewed for Jacksonville. Hear me now and believe me later ... changing the locale is going to pick up steam. My worry is that it's going to happen and going to happen soon. The push will come from some people in very high places on both sides of the rivalry (well probably mostly from Athens). This is PATHETIC. If anyone involved thinks the game is not fair and that Florida has a decided advantage and therefore the game should be moved out of Jacksonville, they can quite frankly get the hell out of town. Yes, I feel this strongly about this. Nobody is more important than this game. Nobody. If the push comes from the UGA side of the rivalry (which is where it's coming from), I will be pissed. So you think you will just waltz into The Swamp and pick up a victory any easier? It's not like Sanford Stadium is a given. I actually like our chances in Jacksonville as much as at home. But again, that's beside the point ... don't mess with this tradition. Quite frankly nobody, not school presidents, head coaches or any legendary player or alumni has the right to mess with this tradition. "Every year the questions arise: Do we move back to a home-and-home series or move it back to Jacksonville," said Frank Crumley, Georgia's executive associate athletic director for finance and administration. "We address that every time and it's not totally decided by us. We have discussions with (Florida officials] and the city of Jacksonville and have to present that back to our athletic board for review and approval." "It's still too early to tell what the sentiment is." ... see full article here. I have an idea ... let's bring the black stripes on the helmet back. Dig up the hedges since we seem to win on the road more consistently than at home. The hell with tradition and history. If we go to home and home we will never be able to get the Jacksonville game back when the realization sets in that we just ruined a great college tradition. Heads should roll if this happens. The divide in the fan base will be a sharp, deep cut. This game in Jacksonville is great for Georgia fans. This game is a wonderful excuse for so many Dawgs to go to SSI and Jekyll and Amelia, Ponte Vedra and so many coastal places in between. This is the game every season for South Georgia Dawgs. Who cares about them though. It's about family and friends. I will never forgive the powers that be if they change this game. My grandparents went to 24 straight. Sure they witnessed Georgia destroy Florida year in and year out, but the memories were as much about the trip and atmosphere as the game. It's what Georgia and Florida fans and families and alumni have that no other teams have. 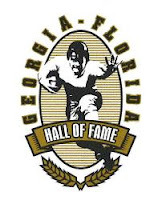 The Jacksonville Sports and Entertainment Board created the Georgia-Florida Hall of Fame. Think about it that for a second, this game has it own Hall of Fame. I'll say it again...The World's Largest Outdoor Cocktail Party is bigger than any coach or player. I don't want to hear the bitching and complaining about Florida having a home field advantage either. So Florida is 16-3 since 1990. What about the 15-4 streak the Dawgs had before that? It has NOTHING to do with where the game is played. NOTHING. Why does a CMR team play better on the road than at home then? Out coach and outplay Florida and the location is a non factor. Beating Georgia is one of the first priorities Steve Spurrier established when he came back to coach Florida and he flipped the recent history of the game. On the way back from SSI my wife and I just smiled at the students driving in convoys on their way back to Athens. It's what Georgia and Florida students have that students in Auburn and Columbia and Baton Rouge and so many other college towns will never understand. These students will graduate and relive those memories for years to come after their days in Athens and Gainesville are over. Going fishing, playing golf, going to the beach, catching up with friends on and around the Golden Isles...you just can't replace these things. The WLOCP in Jacksonville is about making memories. Memories with your teammates, with your classmates, with alumni, with family and with friends. This cannot be overlooked. FYI...A clause in the current contract states that an agreement on an extension or new contract must be in place by June 1, 2009. This reminds me of when Roy Barnes changed Georgia's flag. I don't want to discuss politics and don't care what side of the political aisle anyone is on, but all of a sudden his flag got pushed through without any citizens of Georgia having a say. I'm telling you, I can see this exact thing happening with Jacksonville. Just remember what happened to Barnes ... he ended up losing the Governors mansion because of his back room dealings and ego. Mark Richt and Michael Adams and Damon Evans and Frank Crumley and whoever else just might be about to push for a home and home without publicly asking for feedback. 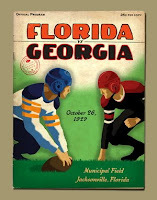 I have this feeling that all of a sudden Georgia is going to pull out of the Jacksonville extension with a blatant disregard to tradition. Ok, I just can't bite my tongue ... the fact that the UGA beat writer from the Macon Telegraph is openly whining and bitching about Jacksonville rubs me the wrong way. I promise not to express my opinion on Syracuse or any other State of New York traditions that I don't understand. I promise. Here is a good piece that Paul Westerdawg wrote on the topic. Unfortunately, I can't get through all of the comments without my blood boiling over the pathetic excuses by some Georgia fans wanting to go home and home. I know, go ahead and flame away if you disagree and don't care about tradition and don't have a sense of history. I'll never understand you and you'll never understand me. My mind will never be changed on this one. I'm a bad person like that. If you want this tradition to stay a tradition and the Georgia/Florida game not to just become another game like everyone else has, you might think of writing the Athletic Department and giving your thoughts. I have a strong suspicion that nobody will openly ask for your opinion before they try and change this game. Voice your opinion Dublin, Moultrie, Kingsland and Valdosta. Speak up Homerville, Cordele, Folkston and Tifton. I know this is posted 9 days after the WLOCP and during the beginning of Auburn week, but I just can't let this topic go. Maybe these fears of mine are unsubstantiated and there is no need to worry. I'm just afraid that the Georgia powers that be are about to turn soft and buck one of the finest traditions in all of America. I enjoyed reading your post immensely and I agree with most of it. However, I told myself a long time ago that I will no longer go to Jax to watch the Dawgs play and I've kept that promise to myself. I honestly have no interest in driving that distance, suffering through several hangovers, watch us get our doors blown off only to make the long trip home and go back to work on Monday. If I wanted to hang out with my friends and make some memories, I can do that a whole lot closer and not feel so dejected on the way home, although the hangover is usually the same, but the drive is shorter. I agree with the tradition of which you speak, but I'll leave Jax for y'all. Thanks. I completely respect that sentiment. My cousin refuses to go back to Jax until the Dawgs take 2 in a row. It's still great for people like the buddy of mine that coaches at Camden County and can't realistically get up to Athens much. Man, that was a GREAT read! Like I told you, I ask all my Georgia friends what they think about the series going to a home and home series. Surprisingly to me, it's nearly unanimous among them that a home and home would be better. They offer the same excuses that you despise, mainly it's an unfair advantage to the Gators. I agree with you. Having the game in Jax every year is special. One of my biggest regrets from my undergrad at UF was that I didn't make it to the WLOCP every year. I really hope all parties involved will come to their senses before they make any decisions. Good post. People need to quit using the venue as an excuse for losing that game. The fact is that we are simply getting outcoached and outplayed. Nothing more, nothing less. Well put! The location has nothing to do with who wins this game. I am like you and will be angry, disappointed, and saddened if they move this series to a home and home neglecting tradition. We have such a unique situation with the GA/FLA game. Only the Red River Shootout is similar. It would be tragic in my opinion if we lose this great tradition. I completely agree, great post. There seems to be an abundance of excuses coming out of our camp when its obvious that when you lose games as badly as we lost to Florida there is no excuse. Spirit walks hand in hand with tradition. Take one away and you have neither. I honestly didn't realize this was really being discussed on the BIG table. I figured it was just some alumni bitchin that wanted life easier on themselves in not having to drive so far. I admit, I'm too lazy to make the drive, but never would I suggest this game should change tradition for my convenience. Bop, in the end, we all know what this comes down to, money. Plain and simple, all mighty $. How much does the city of Jacksonville offer, and is it more than the potential for home gate receipts every year. Plus there is also the schedule thing, which I think affects UGA more than Florida. With Auburn at the back end of our schedule (Florida gets LSU in October usually), we have a very back loaded schedule that can occassionally send us on the road for long stretches. The scheduling flexibility that would come from the extra home game every other year vs. the size of Jacksonville's offer will determine whether it stays in Jax or goes home-n-home. I like Jacksonville, and the unique environment that goes with it, it's special. Very special. But in the end, it's all about the money. We start floating the idea of home-n-home, hope that forces Jacksonville to increase it's offer, and we all go back to normal. Happens every time, and I won't believe it's anything more than a negotiating ploy until reality proves differently. I do agree, the memories are to good to stop making them because a coach and an AD and his staff think UGA is at a disadvantage. As a player in this game how can D Evans not want to keep up the tradition. If they want to break from tradition have the first few home games kick off after 7 p.m. (it's allways to hot for a fatboy like me that early in the season) Please don't move it weve got to many memories yet to come! Mr. Egger ... I really hope you are dead on about the negotiating ploy to get more money from Jax. Again, I could be off base here, but I have this strong suspicion that certain people are wanting it out of Jax and that it has nothing to do with $. Is there a D in front of that train?? The internets have possibly made it to the city of marigolds. You know what else creates tradition? Winning. Hobnail, I guess you are in the camp that feels we lose because it is in Jax? I kind of get the same suspicion, but it has more to do with giving Richt and the AD more freedom in scheduling--avoid lengthy periods away from home and also add one more home game every other year since they always want to get 8. But my comment about a negotiating ploy is based solely off past recollections. It seems every time that contract is about up, the "home and home" talk gets a lot louder, people starting saying that it really might happen, and the contract ultimately gets renewed. That seems to be the way this plays out every couple of years. Fantastic post. You're completely right that this game, this event is bigger than any person. I missed most of the Jacksonville games while I wans an undergrad because of money. The first time I went was a heart breaking loss to the gators (surprise, surprise). But, my only regret was having never gone before. Even this year with our total breakdown against a team I hate more than anything, I still loved the trip. Great post that catches my sentiments. Losing those games has nothing to do with playing in Jacksonville. We could have played most of those games in Peru and still would have gotten our tails handed to us. The team goes down there and becomes scared. This has to do with the fact that they don't believe they should win the game and Florida does. Until we change the mentality that the players have about the game, it won't matter where it's played. I can't stand the thought of having a home and home with UF. Their fans are the worst fans in the conference and I don't want to see any of them on our beautiful campus. I whole heartedly agree. Unfortunately, I think our fears will soon come true and the game will be moved to a home and home. Let's face it, they have been trying to rip this tradition apart for the last few years anyway. It started with the schools insisting we drop the "World's Largest Outdoor Cocktail Party" moniker. What next, no dancing in the end zone or calling unnecessary timeouts? These are the types of things, whether you are a Georgia or a Florida fan, that make this game special. Going to Jacksonville in 2004 and watching us beat those SOBs was one of the greatest experiences of my life. While beating them in Sanford would be great, it just would not have the same feeling. I understand the sentiments for Jax. And a home-and-home series is a terrible idea because it just becomes another series then. But an Atlanta-Jacksonville series isn't that bad of an idea. It still creates the 50-50 split too. I agree that Georgia doesn't lose the game because of the location. I'm uncomfortable with the idea of Florida basically having 5 home games and 3 road games in years that Florida is the designated home team. And that's every other year. If I were another team in the Eastern Division, I would be disgusted with that. People will probably say that other teams in the East shouldn't have a say, but they play in the division too. And what about the Florida fans that live in South Florida? Should we move the game to Miami every other year just to appease them?